Our hand-woven textiles are made from the finest vintage, hand -processed, hand-spun, organic hemp that was woven on authentic handlooms. Their fabric content varies from a makeup of 100% hemp to a blend of 80% hemp and 20% cotton.All are machine-washable. 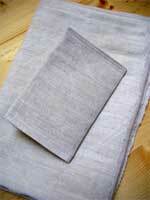 The hemp used in our linens was grown without pesticides on family farms, then harvested, processed and spun by hand. By educating consumers and establishing a market for these wonderful products, we strive to create jobs for villagers in Transylvania and to revive the and use of natural fibers. 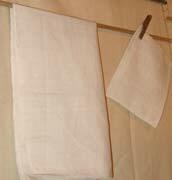 Bath towel with hook (HB4), hand towel with hook (HTP2) & mitt (HSP3) - all available separately. 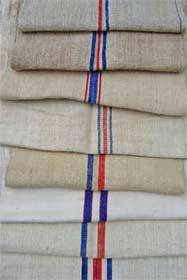 on authentic handlooms of a hemp or hemp-cotton blend. 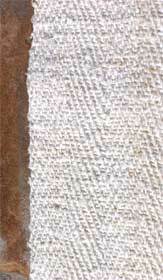 Size ~ 18" x 34" our fabric is vintage thus texture and weave may vary. hand -processed, organic boiled hemp. 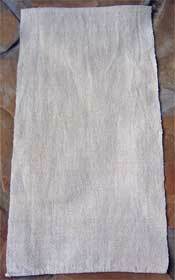 Hand-woven of 80% hemp & 20% cotton. 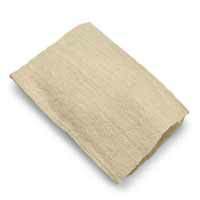 Become very absorbent after a few washes and dry quickly. Made from 100% hemp fabric. Soft and delicate enough to use on your face or baby's skin. Made from boiled hemp & cotton blend.